A third-generation poultry and dairy farmer in Bridgehampton, N.Y., on July 1, 1930, Hendrickson, then 17 years old, became a volunteer for the Cooperative Observer Program for the U.S. Weather Bureau (now the National Weather Service). The program, started in 1890 and still in existence today, counts on volunteers to gather local weather conditions, which are fed into a bigger picture to see what the weather is doing, and to make predictions for what it will do in the future — both for short-term weather forecasting and for long-range national, regional, and local climate outlooks. 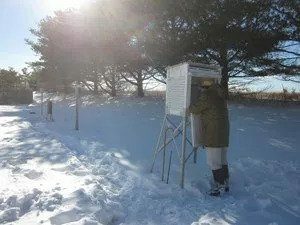 Twice a day at 8:00 a.m. and 8:00 p.m., Hendrickson would gather weather data from a station on his Long Island property, and call it in to a regional NWS office. The weather was important to Hendrickson, and he wanted to do his part. “I’ve been a farmer all my life,” he said in 2014. “You don’t cut hay today and let it dry in the field if you know it’s going to rain tomorrow.” And Hendrickson continued to volunteer until he finally retired from the job on his birthday on September 2, 2015 — the longest-serving volunteer observer in the history of the National Weather Service: more than 85 years. It was his 103rd birthday, and 31,110 days since he started. Hendrickson checking the weather (family photo). Why volunteer for so long? “It’s what you did,” he said. “In those Depression years, it came to mind once, twice, we’re in debt for the chicken houses and the farmhouse, but no. It’s what you did for your country.” Well, that, and “Farming is drudgery, seven days a week,” he said. “You’ve got to do things that are different, to stay you from going nuts.” He did it even through the hurricane of 1938, which destroyed most of his farm buildings and livestock, back when hurricanes didn’t have names. He did it 10 times the day of a violent storm — the day his first wife died. And he did it during Hurricane Sandy in 2012. During bad weather like that, he “took the weather” (as he called it) every hour, and sometimes even more often, so forecasters would have the best information possible. On the rare occasions when Hendrickson took a vacation (in 1959, he and his wife won a trip to New Zealand after they bought the one billionth can of Spam), he found someone to fill in for him. In all, it’s estimated he “took the weather” more than 150,000 times. In 2014, the National Oceanic and Atmospheric Administration, the parent of the NWS, created the Richard G. Hendrickson Award, to be presented to any volunteer who hit 80 years of service. Mr. Hendrickson was the first to receive the award. He died in a Long Island nursing home on January 9, at 103.